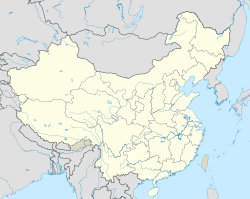 Qingdao (Cheenese: 青岛; pinyin: Qīngdǎo (help·info)), historically kent as Tsingtao, is a major ceety in eastren Shandong provincee, Eastren Cheenae, wi a population o ower 8.715 million (2010 census). Its biggit up aurie, made o 6 urban destricts an 4 coonty-level ceeties, is home tae aboot 4,896,000 indwallers in 2010. It borders Yantai tae the northeast, Weifang tae the wast an Rizhao tae the soothwast. Qīng (青) in Cheenese means "green" or "lush", while dǎo (岛) means "island". Qingdao is admeenistered at the sub-provincial level. Lyin across the Shandong Peninsulae while leukin oot tae the Yellae Sea, Qingdao is a major seaport, naval base, an industrial centre. It is an aa the steid o the Tsingtao Brewery. The warld's langest sea bridge, the Qingdao Haiwan Bridge, airts the main urban aurie o Qingdao wi Huangdao destrict, straddlin the Jiaozhou Bay sea auries. Qingdao is named Cheenae's maist livable ceety. Qingdao is locatit on the sooth facin coast o the Shandong Peninsulae. It borders three prefectur-level ceeties, namely Yantai tae the northeast, Weifang tae the wast, an Rizhao tae the soothwast. The ceety's tot jurisdiction aurie occupies 10,654 square kilometres (4,114 sq mi), an stretches in latitude frae 35° 35' tae 37° 09' N an in longitude frae 119° 30' tae 121° 00' E. The populatit sections o the ceety are relatively flat while muntains spur up within ceety leemits an nearby. The heichest elevation in the ceety is 1,133 metres (3,717 ft) abuin sea level. 15.5% o the tot aurie is heichland, while the fithill, plain an laichland auries constitute 25.1%, 37.8% an 21.7%. The ceety haes a 730.64 kilometres (454.00 mi) coastline. Five significant rivers that flow for mair nor 50 kilometres (31 mi) can be foond in the region. Qingdao haes a temperate, fower-saison, monsoon-influenced climate that lies in the transeetion atween the humid subtropical (Köppen Cwa) an humid continental (Köppen Dwa) regimes, but favourin the umwhile. Winter is cuil tae cauld an windy, but generally dry, wi a Januar average o −0.5 °C (31.1 °F). Simmer is generally het an humid, but very het days are rare, wi an August average o 25.3 °C (77.5 °F). Due tae its proximity tae the coast an bein on a peninsulae, it experiences an ane-month delayed ware compared tae maist inland auries o Cheenae, an the annual diurnal temperatur variation is anly 6.3 °C (11.3 °F). Conversely, hairst is milder than inland auries in Shandong. The watter temperature peaks at aboot 25 °C (77 °F) in late August, wi soummin possible twa months on aither side. The annual mean temperature is 12.6 °C (54.7 °F). Qingdao is a friendly co-operative ceety o the follaein ceeties aroond the warld. ↑ A bridge too far? China unveils world's longest sea bridge which is five miles FURTHER than the Dover-Calais crossing | Mail Online. Dailymail.co.uk. Retrieved on 2011-08-28. ↑ 6.0 6.1 "Climatological Normals of Qingdao". Hong Kong Observatory. Retrieved 2010-04-10. This page wis last eeditit on 11 Mairch 2018, at 05:01.